Copyright © 2007 - 2009 Jeroen van Meeuwen This material may only be distributed subject to the terms and conditions set forth in the GNU Free Documentation License (GFDL), V1.2 or later (the latest version is presently available at http://www.gnu.org/licenses/fdl.txt). This is Revisors upstream documentation. This is the documentation for Revisor, a utility to create and customize your own Linux distribution based on Fedora, Red Hat Enterprise Linux or CentOS. This is also known as a Remix, or Re-Spin, or Re-Master. You may create anything you want with Revisor no matter what it's called though. Jeroen van Meeuwen (RHCE, LPIC-2, MCP, CCNA) is currently a Senior System Engineer, specialized in Linux systems and Systems Architecture, working for Operator Groep Delft in The Netherlands. His experience with computers goes back to the early '90s, with a Philips P2000T being over a decade old, little tapes containing programs but most importantly games, and 16K memory cartridges. Since 1998, he has been involved with Red Hat Linux (5.2 at that time), and was an early adopter of Fedora Core Linux in November 2003, until his first real contributions to Free and Open Source Software were made in 2005. Jonathan Steffan is a community volunteer based in Colorado, USA, and has a long standing record within Fedora for packaging Zope (Web Application Server), Plone (Open Source Content Management System), providing compat-python2.4 packages through Livna and RPMFusion ever since Fedora 7, and voluntarily administering the Fedora Unity servers, Zope and Plone instances, creating and further developing Revisor and pyJigdo, amongst many other things. The Fedora Unity Project consists of a group of concerned peers from within the Fedora community that strive to bring the best possible solutions to the community, in a consistent manner. This, amongst other things, resulted in extensive documentation on various topics often referred to on the Web, published under the Open Documentation License v1.0. The Fedora Unity Project is a different project then the official Fedora Project. The people behind the Fedora Unity Project often contribute to the Fedora Project directly as well, but there's little to no bureaucracy in the Fedora Unity Project. Why do you think these Re-Spins are not released by the Fedora Project itself? This document is licensed under the Open Publication License version 1.0, which is available at http://www.opencontent.org/openpub/. You can get the latest version from http://kanarip.fedorapeople.org/Revisor_Reference_Manual/en-US/pdf/Revisor_Reference_Manual.pdf (PDF), and it's sources live at http://git.fedorahosted.org/git/?p=revisor;a=tree;f=doc. Revisor is a community product by Fedora Unity. Amongst other features, it allows the creation of installation media and live media in the easiest possible manner, through a click-and-go GUI. This chapter gives some insight on how and why Revisor was born, and how the product evolved since. Revisor development started in December 2006, during the Fedora 7 development cycle, in which -as you might recall- the Fedora Core repository, maintained by Red Hat, and Fedora Extras repository, mostly maintained by the community, were merged into one large repository being maintained by both community members as well as Red Hat employees -which are mostly community members who just so happen to be hired by Red Hat, so community altogether. Before then Red Hat employees maintained Fedora Core -as the set of packages upstream for Red Hat's Enterprise product- and the community maintained a repository with additional software; Fedora Extras. Red Hat composed the Fedora distribution every once in a while, but the merge introduced the possibility for packages that were in Fedora Extras to be included in the main distribution, and for the community to also (co-)maintain the (former) Fedora Core packages that originally made up the distribution. In addition to this huge merge of packages, Red Hat employees were also able to release the entire build process to the community, meaning that from the moment the source is committed up and until the release is announced, the entire process is open. Not that is was all behind closed doors or proprietary or anything, the community just couldn't really play with it as much. We now have koji (build system), mash (repository compose from build system products), bodhi (updates release system), livecd-tools (compose tool for live media) and pungi (compose tool for installation media). Composing media was an obscure process up and until the moment these tools exposed the best way to compose (a set of) installation media. Fedora Unity had been building and releasing so-called Re-Spins1 regularly, but they were built using a not-so-very intelligent bash script. Like hundreds if not thousands of other parties that needed to build their own media one way or the other, the entire process was based on the best educated guess of what should happen. Luckily, in the FOSS world an educated guess is often a very good guess, despite the fact that one keeps learning even years after the original engagement. When in December 2006 the compose tools hit a stage in which they were released to the public, Fedora Unity was eager to get these tools and study them and use them for composing their Re-Spins. Up and until then, Re-Spins were composed with the aforementioned bash script that didn't do much but trigger the appropriate commands in a sequence; There wasn't any dependency resolving between the packages included nor did we know exactly how a release was supposed to be composed -it was our educated guess of how it could happen. Although it often led to success, we've had many, many failed Re-Spins as well. With a handful of volunteers, you can imagine the amount of frustration that might give. Fedora Unity was eager to improve their Re-Spin process. So, early February 2007, a number of Fedora Unity members attended “FUDCon 2007” in Boston, and presented a working GUI front-end to both livecd-tools and pungi enabling regular users to also re-compose or re-spin the installation media and live media they had been getting from the Fedora Project. Revisor at this point just made it “as easy as possible”. Besides the possibilities of pungi and livecd-tools themselves, the wizard Revisor had apparently was very, very useful to mere mortals. From that point on, things took off. Fedora Unity decided Revisor could accomplish more then just being a front-end to existing compose tools and enable someone to tweak a lot of settings as well. In March 2007, Revisor was rebuilt from the ground up in order to allow a more flexible process, neing more dependent on the configuration directives it was given from configuration files, command-line parameters and the graphical user interface, and less so on the processes of the existing tools. When in San Diego at the Red Hat Summit (early May 2007), Robert 'Bob' Jensen and Jonathan Steffan gave a presentation on “Customizing Fedora”, the responses were amazing. Since then Revisor has evolved from a front-end to existing tools to the complete compose tool it is today, with lots of configuration options for specific use-cases. For users, Revisor is particularly useful because it has a GUI front-end wizard, which, with the defaults settings, will just succeed in getting a user the media he/she wants. If a user decides he needs little adjustment of the media, the GUI allows for selecting the most common options. If a user decides he needs some less common adjustments, the configuration options gives him very granular control -and as long as the documentation on all the options is sufficient, users will be able to make those less common adjustments. For administrators on the other hand, Revisor is the tool that gives so much granular control over what happens, that it can serve almost every specific use-case. In this aspect, Revisor could potentially replace the compose tools administrators have been developing themselves with a consistent and flexible program flow. This document should enable you to study the process of composing installation and live media, and comprehend the logic Revisor adds to that process. When a user downloads a Fedora release and installs the distribution, the user will need to download and install a number of updates. The “older” the release becomes, the more updates will be available, and the greater the total download size of these updates the user will need to download on top of the download size of the original release media. “older” is in quotes on purpose, because really for an operating system -or “distribution” if you will- being released every 6 months, “old” is quite a relative concept. The number of updates available however, at any given time during the release cycle, may range from 0 right after the release (which has never happened before), to the total amount of packages installed on the user's system (often over 2000). You can imagine the size of these updates ranging from 0 MB to an astonishing 2GB(! ), only 6 months after the initial release. A single Fedora release has a support cycle of 13 months. Some of us do not have the bandwidth capacity or enough data transfer quota to download this many extra, rather useless bits. In addition, some of us do not have an Internet connection at all, and those benefit from getting the updates through Re-Spins as well. The use of updates in Re-Spins has several more beneficial side-effects, which we'll explain in more detail later on in this document. Long story short; If for some reason the software used to compose the media (the release) with does not work for your hardware or your specific needs, updated software incorporated in the composed installer images might resolve that problem. This is the original challenge the Fedora Unity team resolved a long time ago, and is at the base of what Revisor does nowadays. Back in the day Fedora Core 5 was the most recent release, Fedora Unity created so-called live media using Kadischi, then actively developed by Jasper Hartline, another valued Fedora Unity member. In those days, live media could only have a read-only root file system and was not as feature-rich as live media is today. However, just before Revisor came to life, two applications were developed; pungi for creating installation media, and livecd-tools for creating live media. These two applications did their work well; The media composed for a genuine Fedora release, including many different custom live media spins were, and still are, created with these tools, not to mention the many downstream consumers that use these tools to do the exact same thing. Immediately, the Revisor developers set themselves a target to provide a single interface to both of those tools, and give the user more flexibility so that the user could bend the rules without breaking them. Revisor allows you to build and customize your own Remix, Re-Spin, Spin or even your own distribution, based on Fedora and derivative distributions such as Red Hat Enterprise Linux and CentOS. Revisor builds installation media, live media, installation trees, cobbler distro's and profiles, virtualization images and more. We'll now briefly explain what each of these terms mean and what Revisor can (or cannot) do for you. Installation media is what you normally use to install a system with. The installation media composed will allow you to go through the installation process, answering a number of questions (either manually or through kickstart), and ends up in a system running the distribution you install. 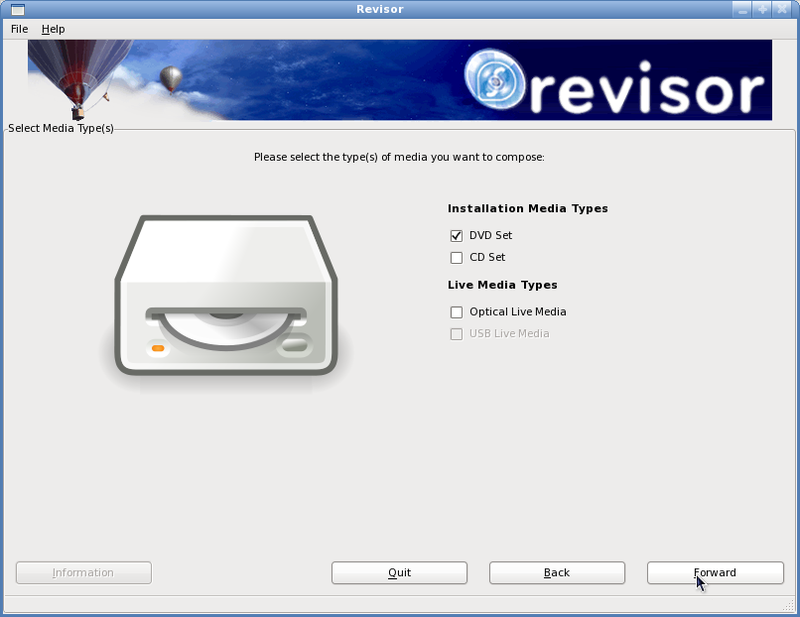 Composing installation media using the Revisor GUI allows you to choose the media (CD, or DVD), the packages to be included on the media (also called RPM payload). Using the command-line interface, Revisor also allows you to choose DVD Duallayer and single- or dual-layer Bluray. Installation trees are typically used in environments where a distribution needs to be deployed over multiple systems, or is very volatile. Installation trees are often made accessible through HTTP or FTP protocols, in one place, and do not have as much overhead (in creating .iso files, and burning those to optical media to distribute them). Live media often is a perfect showcase for an Operating system, Desktop Environment or any other thing you want to show. Also, since Live media is read-only, live media perfectly allows for a kiosk system, a system that may change while it's running, but restores all original settings when rebooted. Live media is also installable. You start out with a system and boot it from live media, then choose to install the live media. This however is inferior to real installation media, but is convenient if you happen to like what you see when running from live media. Media composed with Revisor is extremely reproducible. Using kickstart_exact_nevra, you can even select specific versions of packages to be included on the product. When composing different types of media, such as CDs and DVDs, Revisor composes these discs in one run, making the different media completely consistent. pungi would require you to run twice, once for CDs, and once for DVDs. This is because pungi uses the part / <size> kickstart configuration directive to set the maximum size of the media, and has no option to override the size on the command-line, nor to compose a certain set of media (it all depends on the size). Over the years, Revisor has been adopted to serve a large number of use-cases, where use-cases stretch from media being composed as efficient as possible, as robust as possible, specific deployment needs and expectations, and to match the Fedora Project Release Engineering tools' behaviour. All this allows you to configure a lot, and thus customize a lot, making Revisor more of a flexible framework. Revisor has a Graphical User Interface or GUI, in addition to the Command Line Interface or CLI, which makes Revisor more accessible to users then the other tools, which are CLI only. Most people only know of Revisor through the GUI, and may think there is no CLI to Revisor. Only when it comes down to many of the additional features that Revisor has, and that do not fit in a simplified GUI, one gets down with it using the CLI. Revisor has one of those old-fashioned Free and Open Source Software development communities, allowing anyone to make a contribution to Revisor. In fact, Revisor has not bounced a single patch since the project started. Therefor, it improves faster then any of the other compose tools, and is better adaptible to your needs and expectations, because unlike the other utilities, Revisor is not limited to use-cases that apply to Fedora Project Release Engineering. Revisor has a plugin system so that you can easily extend Revisor. This plugin system gives you full control over the Revisor procedures, and hands you off anything Revisor knows about the compose process. There's are multiple plugins available from upstream as well. To give you an example, the ability to replace isolinux.cfg after the compose is done, is a plugin. See Chapter 9, Plugins for more information. Revisor has extraneous debugging, which enables you, as well as the supporters and Revisor's developers, to trace down what happens exactly, and where anything might have gone wrong. Revisor is one of the utilities that uses the same cache over and over again, across multiple product composes. If you have downloaded something once, chances are you're going to need to download it again and again especially if you are a frequent user of the compose tools. Revisor caches all the downloaded packages in /var/tmp/revisor-yumcache/ (by default), enabling you to download just once and never again. Excluding packages from repositories means a great deal. Not having them exist in the Package Sack ensures the package will not end up in the product. This may be what you want for maybe just a few, or maybe an awful lot of packages. Using the alternative configuration file format, kickstart, in use by every other compose tool, and the repo configuration directive that is available with kickstart, you can exclude packages using the --exclude= parameter to the repo configuration directive. However, that parameter does not allow wildcard matches. Including only a certain package, or certain set of packages is valuable when a lot of packages exist in the repository configured, but you only need one or two. Like during normal YUM operations, the baseurl(s) and the mirrorlist configured for a repository are used concurrently. This is not possible with the kickstart configuration directive repo, which takes either --baseurl or --mirrorlist, but not both. Settings available with YUM are available within Revisor as well, like repository priorities. Using repository priorities, you can have YUM decide to pull a package from the repository with a higher priority (a lower priority number) rather then a repository with a lower priority. YUM plugins, such as yum-fastestmirror, yum-fedorakmod, are available, giving you even more control over the behaviour of YUM. This chapter contains the installation instructions for Revisor. You can install Revisor using RPM packages from the repositories already configured on your system. Shorthand package for the Revisor GUI. The CLI version of Revisor. This package is always installed, as it contains the Python code for Revisor's core. Installing just this package will give you the command-line version of Revisor, and prevents the graphical dependencies from the revisor-gui package to be installed as well. The GUI version of Revisor. This is the actual package containing the Graphical User Interface, as opposed to revisor. Depends on revisor-cli, and thus also installs the command-line version of Revisor. On Red Hat Enterprise Linux 5 or higher, and derivatives, install the Extra Packages for Enterprise Linux (EPEL) repository. On Fedora 7 or higher, and derivatives, no additional repository configuration is required. Please bear in mind that Fedora releases that are past the point of End-Of-Life, approximatly 13 months after the initial release, are not supported anymore for use with Revisor. Also, the version of Revisor running on these EOL versions of Fedora are not supported anymore. You can run directly from within the source tree. See Section 14.1, “Running Revisor from Source” for more information on how to do so. Do not run Revisor from source while RPM packages have been installed. Files managed by a package will get created, moved and removed when using Revisor's source tree, and updates to the installed RPM packages will destroy these changes. You can create your own packages, so that you have all the benefits of RPM. See Section 14.2, “Building Revisor Packages” for more information on how to do so. Revisor configuration can be performed using Section 4.1, “Configuration Files”, or through Section 4.5, “Command-line Options”. We seriously recommend you consider configuration files for products you are going to have to build more then once, or for seriously complex products that make use of Revisor functions beyond what is a simple click-and-go exercise, such as rebranding and other advanced customization. On the other hand, if you are just to try one or two simple things just for this once, command-line options might be more suitable. Revisor configuration files, such as /etc/revisor/revisor.conf, contain information and settings unique to Revisor. A Revisor configuration file is where you specify default options, and include information on different products you want to compose. YUM configuration files, such as the files in /etc/revisor/conf.d/, contain configuration for YUM. To be more precise, Revisor doesn't even handle the files (it let's YUM do so). The files in /etc/revisor/conf.d/ practically contain the same information as /etc/yum.conf combined with the files in /etc/yum.repos.d/ (but not exactly the same content!). The global section. Options specified in this section apply to all the models defined in this configuration file. Model configuration. You use one section per Model, and each section represents a product. Model sections basically define a single product. Amongst other things, the distribution name, release version, architecture for the product to be composed and what YUM configuration file to use, are (often) defined on a per-model basis. There is a large number of settings available for models, and they are all related to how the product is going to look like. The product name, the location of the RPM payload for installation media, the ISO label, the YUM configuration file to use, are all model settings. Using models, you can reproduce the outcome of the compose process, a product, simply by not changing the model configuration anymore. If you want something different, you can just add another model section, and name it differently. The default YUM configuration files used by Revisor. In a model configuration section, the main = setting points to one of the YUM configuration files in /etc/revisor/conf.d/. The YUM configuration files configure the repositories available during a product compose, as well as the available architectures. The Revisor packages (or any packages in Fedora for that matter) are not allowed to overwrite existing configuration files in /etc/, and they should thus not do so. Users anticipate that if they change a file in /etc/ these changes are persistent in that they are not destroyed when a package is updated. If an update to Revisor is installed on your system, files with the extension .rpmnew may be created --if you had changed anything in the file before applying the update. Since this world isn't perfect, configuration errors may exist in the configuration files shipped with Revisor. Please pay close attention to updates to these configuration files by searching for and examining the .rpmnew files. You can use any file location (not just /etc/revisor/) for your own custom configuration. If you are creating your own models off of the ones that ship with Revisor itself, please consider using an alternative configuration file (a file other then /etc/revisor/revisor.conf, or copy the original file for safekeeping. This way, you can always return to a working, sample configuration file and test whether it is Revisor causing errors, or configuration mistakes. The default Revisor configuration file, /etc/revisor/revisor.conf consists of multiple sections (the file is in .INI format). One is the [revisor] global section, where you specify configuration options that apply to each other section or Model. The options from the global section are read, tested and set. The options from a model section are read, tested and set, regardless of whether the global section had caused the setting to be set to a certain value already. # this configuration file and can thus be removed. Note that when running Revisor in Graphical User Interface mode, you can still change a lot of the settings supplied by Revisor through the configuration files loaded. When you are running Revisor in GUI mode, the configuration files supply the defaults. The files in /etc/revisor/conf.d/ are YUM configuration files. Revisor directs YUM through its API to use these files during the compose process, and does not handle these files itself. This chapter explains how these files are used, how you can change them and lists a few tips and tricks. Because these files are YUM Configuration files, you can configure anything that YUM supports. See man yum.conf for more details. When configuring a repository URL, make sure you do not use $releasever or $basearch variables. Since Revisor allows cross-composing distributions between different versions of the operating system, as well as different architectures, these variables need to be expanded to the value intended. Ergo, if a repository configuration has http://server/repo/$releasever/$basearch/, for a Fedora 12 i386 YUM configuration file you would need to change such in http://server/repo/12/i386/. If you have a local mirror of Fedora, you can use the baseurl configuration directive in each repository configuration section to tell YUM to use the local mirror. Optionally, you can also disable the mirrorlist, preferably by outcommenting it, so that YUM will only use the local mirror. The default baseurl uses http://download.fedoraproject.org/. This location may or may not be suitable for you. If you have a local mirror, you might want to change this setting here, or add your mirror to Fedora Project's Mirrorlist. You can add your local mirror to the Mirrorlist, so that the Fedora Project mirrorlist redirects you to your local mirror. Additionally, systems in your local network(s) will be redirected to the local mirror. The local mirror does not have to be a public mirror in order to do so. See http://admin.fedoraproject.org/mirrormanager/ for more details. Alternatively, you can set each baseurl directive to the location of the repository on the local mirror. If you have the repositories on your local filesystem, configure a baseurl of file:///path/to/repository/. Make sure to supply the correct path to the repository. file:// is the "protocol" for the location, and the location is /path/to/repository/. Put together, you have three slashes. A DVD does not contain enough packages to rebuild the installer images. If you are using a DVD and you want to rebuild the installer images, you will need to have a network connection and a mirror you can reach. If you have no need for rebuilding the installer images, make sure you configure Revisor to not rebuild the installer. There's a HOWTO on the subject in Section 6.4, “HOWTO: Re-use Installer Images”. There is a list of required packages, but since the packages change per release and may change in the middle of the release cycle as well, we cannot hand you a list that just works. If you really want to know though, the list of packages are in Revisor's cfg.py. Maybe you can write a plugin with a command-line option that spits out the required packages per model, and optionally download all of them, and create a repository out of the downloaded packages. If you do so, please let us know at the Revisor Development mailing-list at https://fedorahosted.org/mailman/listinfo/revisor-devel, and we'll be glad to help you out or maintain the plugin upstream. When adding a third party repository, make sure you add the correct release version as well as architecture to the Revisor YUM configuration file. Verify the location for the baseurl and/or mirrorlist you configure manually or through YUM. Make sure you expand any $releasever, $basearch and $arch variables. There's a HOWTO on adding third party repositories included in this document at Section 6.1, “HOWTO: Add a Third Party Repository”. Creating your own repository is relatively simple. You take a directory, dump some RPM packages in it, and run createrepo. See man createrepo for more information. People often wonder how Revisor handles comps.xml group files. When you create your own repository, essentially a third party repository, follow the directions in Section 6.1, “HOWTO: Add a Third Party Repository” to add the repository configuration to Revisor's YUM configuration, since your own repository is a third party repository as well. Before you use the (modified) configuration file, take it for a test run to see if you have configured YUM properly. Should this show errors, or fail otherwise, add -d 9 to the command line in order to have YUM spit out more detailed debugging output. This detailed output should leave you a clue or two about what might be wrong with the configuration. Configuring a Proxy server to be used can be done through YUM, using the proxy= configuration directive. With the command-line options available, you can configure options that either override what is in the configuration file or have simply not been configured using the configuration file. With the default configuration files that come with the revisor-cli package for example, no media products have been pre-configured in the global configuration section. In the revisor-unity package however, some default configuration has been applied so that Fedora Unity Re-Spins actually create CD, DVD and Rescue ISO images as well as the Installation Tree, and include the sources. Only some configuration options have CLI parameters. Use revisor --help to see a complete list of configuration options you can supply on the command line. Note that command-line options always override the configuration settings supplied in the configuration files. Additionally, when using the graphical user interface, command-line options can be overriden by GUI interaction. This is a quick start guide to get you on your feet using Revisor really quickly, without any modifications, advanced options, whatsoever. The first thing you'll notice, is that the Advanced Options are disabled. Don't worry, as the advanced options are very limited at this point and do not get you anywhere right now. Press Get Started to get started. Select the DVD Set to compose installation media with the maximum size of a DVD per disc. This chapter includes a couple of HOWTOs on use-cases that Revisor serves. The revisor-unity package includes the configuration files Fedora Unity uses to execute automatic and unattended composes for Re-Spins. Kickstart is a configuration file format for automating installation procedures. Or at least, it was, originally. Nowadays, kickstart files are used as input to the compose tools, including Revisor. Revisor again is unique in that it does not require a kickstart file for input. The other tools only take kickstart configuration files. Revisor though allows most of what is in a kickstart file to be configured interactively in Graphical User Interface mode. There's two cases in which a kickstart file is used differently. One is during the compose of installation media, and the other of course is during the compose of live media, or virtualization media. The repo command in kickstart is used when Revisor is configured to use the repositories configured in the kickstart file only. Use kickstart_repos = 1 to enable this feature, or set the appropriate checkbox in the Revisor GUI. The %packages section in kickstart is used to determine the RPM payload on the installation media. It can include groups and packages, and exclude packages. It accepts wildcards, both in includes and excludes of packages (but not groups). By default, groups @core and @base are included in the package manifest. You can specify @base to not be included, by using %packages --nobase, but @core cannot be excluded using a kickstart package manifest. Using kickstart_exact, you can exclude @core and @base so that you need to explicitly select them in the kickstart package manifest. This chapter lists the details of the compose process as well as dives deep into the features of Revisor. Of course, the compose process for installation media is a little different then the compose process for live media. Revisor initiates and loads plugins, options, and defaults. At this point, Revisor has a so-called ConfigStore that holds all options Revisor knows about. Revisor reads the options from the command-line. Revisor reads the configuration file specified with the --config command-line parameter, or uses it's builtin default, /etc/revisor/revisor.conf. Revisor reads the global [revisor] section for all settings available in it's ConfigStore and sets those configured in the global section. Remember that if an option is not available in the ConfigStore but is configured in the global configuration section, it is ignored. If a model is specified in the configuration file's global section [revisor], Revisor will set that model to be used and loads it. If a model has been specified on the command-line, with option --model, Revisor loads that model. When loading the model, Revisor again iterates over all the settings that are in the ConfigStore, checks if the setting has been configured in the model section, and adjusts the setting in the ConfigStore if necessary. Again remember that if the ConfigStore does not know about one or the other option already, that setting is ignored. Now that the defaults and configuration file settings have been applied to the ConfigStore, it is time for Revisor to look at the options specified on the command-line to see if you wanted to override anything. While loading each configuration setting available in the global [revisor], model-specific sections and/or command-line, Revisor checks every settings against a function that is specifically written to check such setting. For example, the label of an ISO cannot be longer then 32 characters. Especially in CLI mode, these settings build up the task list for Revisor. If there's nothing to do, Revisor will throw an error explaining what's missing. If there's things to do that cannot be done in one run, Revisor will throw an error explaining that. In Graphical User Interface mode however, if the settings loaded so far are all OK, the GUI will start. Since you can still adjust a few settings from within the GUI, the settings loaded so far will be the defaults for configuration settings that have a dialog for you to adjust them with, throughout the rest of the process. As we've explained before, composing installation media is a little different then composing live media. That's not just because installation media should start an installation procedure and live media should show you a nice, shiny, fully-functional Desktop. Of course, Revisor goes through the loading of configuration options mentioned in the Overview. When you're done specifying options in the GUI, or when Revisor thinks it can go ahead using the options specified in CLI mode, it takes the list of packages selected from either the GUI or the kickstart %packages manifest. Not getting too deep into details here, yet, because some of these things are routines shared with other composing modes, but here's a few additional considerations Revisor makes when doing the package selection. Normally, a kickstart %packages manifest only allows you to select package names. With Revisor though, you can select exact package NEVRA to select a certain version or architecture for the package that you want. Additionally, if a package is not available, Revisor searches the Provides of the available packages. Revisor has a respin mode that in some aspects differs from the regular routines. It is intended to reflect behaviour of tools in use by the Fedora Project Release Engineering team as closely as possible. Re-Spin mode only affects installation media products. In Re-Spin mode, the way the RPM payload is determined from kickstart differs from Revisor's normal procedures. See Chapter 7, Using Kickstart for more details on using a kickstart package manifest. Depending on how you use this instructions or information, there is a slight difference in the package set that ends up on the media you compose. a list of mandatory packages. If you select or include the group, these packages come with it. a list of default packages. If you select or include the group, these packages will come with it as a default. If you only want the mandatory, minimum set of packages for this group, in a kickstart package manifest append --­­nodefaults to the group line or in the Revisor GUI, right-click on the group and choose Deselect all packages. a list of optional packages. If you select a group you have not yet selected these packages. To select the optional packages of a group, in a kickstart package manifest append --optional to the group line or in the Revisor GUI, right-click on the group and choose Select all optional packages. a list of conditionals. If you select this group, these conditionals are thrown into the package sack and transaction information and include or exclude other packages. Suppose you select the '@nl-support' or “Dutch Support” group from the Languages or Localization category, you would end up with support for the Dutch language in all applications that have that kind of support. This is the logic Revisor applies when running in Re-Spin mode (on the CLI, specify --respin). It imitates the behavior pungi has, and thus enables you to copy that behavior. Note that --respin has other implications as well. First of all, it iterates the groups in the kickstart package manifest. For each group, it appends the names of the mandatory packages to a list, and depending on the additional parameters specified with that group (--nodefaults or --­­optional), appends the names of the other packages in that group as well. Then it iterates over the package names in the package manifest. These package names are appended to the same list of package names too. This includes package 'names' with some sort of wildcard (?, or *). Then it iterates over all the excluded packages, appending each of those to the YUM configuration exclude list. Now that Revisor has a very simple, flat list of package names, it uses YUM's internal matching logic 5 to get what packages in the repositories matched exactly (by name), matched (by wildcard) and did not match at all. Revisor then selects the exact matches and matches, adding them to the transaction. Iterate all packages in the transaction and list their requirements, then for each of those requirements, find all packages that provide a matching capability, add those packages to the transaction, and don't forget to add the requirements those packages have themselves, back into the pile of (unmet) requirements. Iterate all the packages and for each of the requirements found, find the best package that meets the requirement. This is also YUMs default behavior. Anaconda uses YUM during the installation, and this is the behaviour of YUM used during the installation. So, what does this mean? Basically, it means that if there is a requirement for a capability, all packages providing that capability are being pulled in. Now imagine package 'foo' requires capability 'web-client'. There's a number of packages providing that capability, right? So you get Firefox, lynx, elinks, konqueror, safari, Netscape, Internet Explorer, emacs, for free! All of those pull in their own dependencies also, of course. If you catch this before it catches you, you can prevent the packages from being pulled in during dependency resolving by not making the package available in the Package Sack in the first place, using the -firefox syntax in the kickstart package manifest, and setting kickstart_uses_pkgsack_excludes to 1. You may have thought of it; pulling in packages this way may give you a package set (or RPM payload) that has conflicting packages. Imagine package foo requiring capability bar, which is provided by two packages that conflict with one another (either on explicit Conflicts: RPM header or file level). Both will be pulled in, hence disabling you to install everything ('*' or -previously- @Everything in the kickstart package manifest). If you are composing a large distribution of which 3 million users in even so many different situations having so many different expectations and desires, you will want this behaviour, since you won't be able to determine which one of the packages for each capability someone in that group wants, and which one may not want. Or, in case of upgrades, what the system needs. Shipping them all on the same media is the best solution in these cases. When creating minimal installation media, or media with a minimal RPM payload. When creating installation media that is to be used with installing "Everything" in the RPM payload. Exclusive dependency resolving is what YUM does when you execute a yum install. Unless you've specified one of the packages satisfying any of the dependencies in the transaction, YUM is going to look up the best match for you. This results in the installation of only one package providing the requirement(s) of other packages, rather then all packages providing said requirement being installed. As an example, imagine you install a package foo which requires capability web-client. Using exclusive dependency resolving, YUM would select one package providing the web-client capability whereas inclusive dependency resolving would include all packages providing the web-client capability. During the installation procedure, one of the major features of installation media, anaconda is going to use YUM dependency resolving to satisfy all the dependencies. Note that an installation procedure is not the same as an upgrade procedure. With an installation procedure for example, you have control over the partitioning layout whereas with an upgrade procedure, you have none. More importantly, during an upgrade procedure, the (already installed) system has an existing package set which needs to be updated/upgraded and thus could possibly introduce dependency resolving problems, because of third party packages installed on the system, or because the media used to upgrade the system with does not contain the software packages needed to complete the upgrade RPM transaction. With --copy-dir, you can specify a path Revisor should copy onto the media. In the case of installation media, the path specified with --copy-dir will be copied recursively to the files/ sub-directory at the root of the ISO image (or the first ISO image if you compose split media). If one kickstart profile is not enough for you to deploy the product onto your systems, create a directory that holds multiple kickstart files and specify the path to that directory using --copy-dir. The kickstart files now end up available to the installation procedures as cdrom:/files/*.ks, and can thus be used by specifying them on the kernel cmdline (ks=cdrom:/files/profile1.ks), or, when used in combination with --isolinux-cfg from the Isolinux Plugin, can be added as an option in the isolinux menu. If you have files or scripts that need to be copied onto, or run on, the installed system before it attempts to reboot and operate normally, you can use --copy-dir to make these files and scripts available during the installation and copy or execute them from either %pre or %post scripts. In the case of live media, the path specified with --copy-dir will be copied recursively onto the root directory (/) of the live media filesystem (which is probably loop-mounted onto /var/tmp/revisor/). $ cp -a /home/user1 /tmp/something/home/. Revisor tends to clean up after itself by default. If a product compose succeeds, you (probably) don't need to change this default behaviour. However, by default, Revisor tends to leave the YUM cache directories untouched. This is to prevent you from having to download all the packages a second, third or more times when you run another compose. To change this default behaviour, Revisor has an option --clean-up. The default value for this option is 1, meaning Revisor will clean up it's temporary, compose-specific files, but no files that could be re-used. Specifying --clean-up=0 will cause Revisor to leave everything behind and not clean anything up at all. This is most ideal for troubleshooting purposes, where one needs to examine the temporary, compose-specific files and see what went wrong. To clean up everything however, because for example you might be low on disk-space, use --clean-up=2. Revisor will then also clean up the files that could be re-used. There's one exception to the rule of cleaning up. /var/tmp/revisor/, or put more accurately, the path specified as the installroot in the YUM configuration file configured with the model used to compose the product, will not be cleaned up afterwards. When composing live media, this directory may still be in use as a mount-point for the live media filesystem. Removing this directory recursively in these cases would not make sense. The Cobbler plugin is able to put the product composed into a Cobbler environment, by handing off the built product to the existing Cobbler infrastructure as a distro, and creating a profile. Using this module, one can automatically import the Revisor product into a Cobbler environment, and immediately use the new Cobbler profile to start deploying or automated testing, maybe. A small change to a ISO image does not require you to download the complete ISO image if you have a copy of the old ISO image. The generation of Delta ISO images is only applicable to situations in which the ISO image does not contain SquashFS images. SquashFS images are smaller, but all SquashFS images are unique. Since the Delta principle is based on similarities, and no two SquashFS images are alike, creating a Delta on two ISO images containing SquashFS images will lead to a Delta pratically the same size as the SquashFS image. For Live Media that compresses the ext3 filesystem image into a SquashFS image, since that SquashFS image is probably over 97% of the size of the ISO image, creating Delta images for compressed Live Media does not make sense. For installation media however, most RPMs would be similar as well as (potentially) the installer images. Yes, the Graphical User Interface for Revisor is actually a plugin. The isolinux plugin adds the --isolinux-cfg command-line option to Revisor. Specify a file here, and the original isolinux.cfg that is built as part of the compose process is replaced by the isolinux.cfg specified. The rebrand plugin hooks in to Revisor at several different stages. The goal of this plugin is to ensure no trademarked packages end up on the media. Trademarked packages may include fedora-logos, redhat-logos, and so forth. The plugin adds a --rebrand option, to which you can specify the name of your new product. When rebranding Fedora to Omega for example, specifying --rebrand Omega would be sufficient to make sure the product does not have any Fedora trademarks. Something about using Mirrormanager to redirect you to the local mirror (so you do not have to edit YUM configuration files). Something about using the localrepo DNS alias to point to your local mirror (either through real DNS or through /etc/hosts), so you do not have to edit the YUM configuration files. How Does Revisor Handle Comps? What is the relationship between Revisor and Pungi? Where pungi builds a bunch of RPMs into ISO images and installation trees through one single procedure, perfect for Release Engineering on something like the Fedora Project, Revisor does it different entirely. What is the relationship between Revisor and livecd-tools? Revisor depends on livecd-tools for the composing of live media. Creating the filesystem to install the packages to, turning that image file into a SquashFS file, and applying the settings inside the chroot. How do I create an updates.img? The following test cases describe different types of testing a new Revisor release. This section has a few simple test cases ensuring configuration shipped with Revisor works as anticipated. Installed are all dependencies for the Revisor CLI interface. Make sure spin-kickstarts is installed, a package for sample kickstarts. Each section should have a configuration file listed as main. If everything is well, since STDOUT is redirected to /dev/null, you should see no messages at all. The main Revisor configuration file is /etc/revisor/revisor.conf. The file lists a series of models, each having their own YUM configuration file in /etc/revisor/conf.d/. For each model in /etc/revisor/revisor.conf, the main setting for that model should point to a valid file. Revisor has baseurls in YUM repositories set to http://localrepo. This URL will not be retrievable for many people, but allows the developers to quickly change mirrors. Repositories that are unavailable at the moment of testing will throw errors Revisor can't do anything about. If the directories revisor-yumcache/ and revisor/ in /var/tmp/, the default working directory, are not writeable for the user then YUM will throw permission denied errors. Remove /var/tmp/revisor/ and /var/tmp/revisor-yumcache/ or run the command with root permissions. In the initrd.img of the composed product, if 32-bit, /lib/ld-linux.so.2 (or any other version) should link to /lib/ld-2.9.so (or any other version). If /lib/ld-linux.so.2 links to itself, the media will fail to install. This chapter sheds some light on development of Revisor, such as different branches and maintenance policies, versioning schemas, etcetera. This part of the documentation relies on whether you have sudo set up properly. If you have not, you're on your own. The latest code in GIT can be built into a RPM you can install but one of the advantages of having the complete source tree is that you can run it directly from that source tree so that when you pull in the next updates you do not have to rebuild the RPM. Note that we do not bump the version number for every little change we make, and as such the RPM built does not allow you to use rpm -Uvh or rpm -Uvh --oldpackage. Of course, Revisor's Makefiles also allow make install, but that leaves a number of unmanaged files on your computer you would have to track down manually in order to remove Revisor completely. When running revisor from within the source tree, you cannot have any of the Revisor packages installed. Having Revisor RPM packages installed regardless will mess up the GIT repository or source tree. In Revisor 2.1.0, also create symlinks from within the appropriate /usr/share/man/man$x/ directories to the source for these man pages in $PWD/doc/. Note that revisor needs root privileges to run, and that you'll need to sudo or su-c to gain those. Use here whatever you find the most convenient; Revisor though should have a nice error message when run without those privileges. To be able to run Revisor from within the source tree, you'll need to install the required packages for each component, of course. Add the appropriate models in the appropriate configuration file for Revisor. A model in Revisor describes a product. A package manifest is the list of groups and packages to include or exclude from a transaction, in a kickstart configuration file. 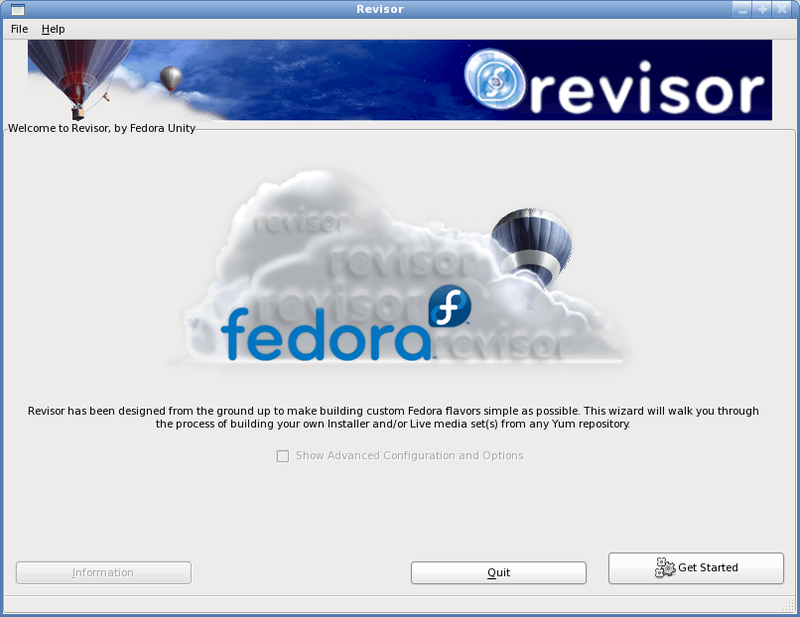 A Fedora Remix is a product based on Fedora, with Fedora packages and optionally, other packages as well, such as those from third-party repositories. A Fedora Re-Spin is a product that is composed for the single purpose of including updated software packages into the product. It uses the same compose procedure as the media that the Fedora Project composes and releases, but includes updates. Fedora Unity releases Fedora Re-Spins every so often, twice or trice per release. A Fedora Spin is a custom set of software packages, often for a specific audience. Spins include a KDE Spin, which contains KDE software packages rather then the Desktop spin, which is based around GNOME. Similarly, there are XFCE, LXDE, Sugar, Education, Games and Developer Spins. Fedora Spins have gone through the Spins Process (http://fedoraproject.org/wiki/Spins_Process), and have been approved trademark usage by the Fedora Project Board. When YUM creates a list of packages available from the repositories configured, including package metadata such as dependencies and provided capabilities for each package, YUM creates a PackageSack. It's basically a large bag with all Package Objects, filtered by compatible architectures for the configured architecture. This is the configuration reference for Revisor. Options are listed in alphabetical order. Answer yes to all questions. This enables you to run an automated, unattended compose. Should Revisor not clean up at all (0), clean up it's temporary build data (1), or everything (2). Note that everything includes the yum cache. A directory tree to copy onto the media created. In the case of installation media, the contents of the directory specified are copied onto cdrom:/files/. In the case of live media, the contents of the directory specified are copied onto the root filesystem of the live system. See also Section 6.3, “HOWTO: Include folders and files on the Media”. Tell Revisor to copy files, even when they are local. This applies to relative corner-cases where the repositories or the destination_directory is mounted over NFS, and some actions cannot be performed. The level of debugging. 0 is the lowest debug level, whereas 9 is the highest. Revisor turns up the volume quickly. The logfile on debug level 9 may very easily become 20-30MB. The destination directory for the product. Revisor creates a sub-directory with the name of the model used, and places the product in that directory. Whether to obtain the source along with the binary RPMs used. This is False by default, and therefor the source is not included by default. Note that if you are distributing your product to third parties, you need to be able to provide the sources along with the binary product. Whether to set the isolinux.cfg entry that makes the installer use the kickstart included on the media, as a default. Tells Revisor to ignore @core and @base groups (like with %packages --nobase) and only add what is in the package manifest. Tells Revisor to only add what is in the package manifest. In addition, if the transaction changes (because of dependency resolving, for example), Revisor will stop composing. What kickstart file to use. When in CLI mode, this is a mandatory setting. Whether to include the kickstart on the media so that the installer may find it as cdrom:/ks.cfg. Where to save the resulting kickstart. In GUI mode, when changes to the package set can be applied, saves those changes out into a new kickstart file. Whether to create Bluray Duallayer installation media (47GiB). Whether to create Bluray installation media (23GiB). Whether to create CD installation media (685MiB). Whether to create DVD installation media (4.3GiB). Whether to create DVD Duallayer installation media (8.0GiB). Whether to create a an installation tree[b] (for publication over HTTP or FTP, or through Cobbler). No size limit. Whether to create a unified ISO, installation media (no size limit). Whether to create Optical Live media (size unknown). [a] Note that the installation tree is always created. See Chapter 8, Compose Process Details for more details. [b] Note that the installation tree is always created. See Chapter 8, Compose Process Details for more details.